Going through the free Routledge journals I stumbled over this article from the Journal of Wetland Archaeology. It is mentioned as a Petersen Type D sword, dated from the first quarter of the 9th century (~800-825 AD). In the Old Danish territory type D's are quite rare with only 2 examples found in the same lake (Sørup Lake in Northern Jutland). For our discussion it has a bit the same kind of metal hilt decoration as the Egå sword (except no center ring), but one of the Sørup swords is probably an even closer match in that regard (the AM6521 I posted about above in this thread). Lund Universitets Historiska Museum has to my knowledge not their collection online, so this is the only picture I can find. Acta Archaeologica Lundensia Series 4, Volume 4. Oppmanna Sjö Sword. Type D (~800-825 AD). The image is from "VIKINGS:The Battle at the End of Time" by Tony Allan However the book does not have any more images of the sword or information about it. Definitely not current and not in English either, but I found a picture of the reported find of the Bildsø Sword in the spring of 1866 in Illustreret Tidende 13/05 1866. No report of a scabbard; but this seems to be a deliberate water deposit. We also see the pommel from the top !! Important for a reproduction. What is really interesting is that back then much more of the hilt was preserved, that its the case today (so I guess its wood that seems has rotted away). The image is from "VIKINGS:The Battle at the End of Time" by Tony Allan. However the book does not have any more images of the sword or information about it. Lucky find! This hilt seems really quite unique... type-D includes such a great diversity of decoration styles, I can't think of any other examples that compare closely to this one. The "crowns" at the end of the grip (possibly referred to as the vettrim and valbost in the Sagas) are another interesting and rare feature... each triangular point seems to show a small face with two eyes and a pointed beard or snout. By chance I just spotted another image of this sword on Pinterest; the find-place and museum were not identified. Quality is poor but shows some other views of the hilt. "As is typical for this type of sword, the hilt was decorated symmetrically in relief and the véttrim (ferrule) around the handle was adorned with human faces or masks "en face", presumably showing male faces as the decoration seems to include moustaches." Her dating of the sword is apparently exclusively based on Petersen's chronology, so in reality it can be both earlier or later than 800-825 AD? Another of the best preserved Danish viking swords (when it comes to the amount of metal on the pommel) is an old undocumented find (you are not certain where, but probably around Kalundborg or Holbæk in the western part of Sjælland). Haven't been able to find any more documentation than that, but I think I read somewhere that the tried some electrolytic conservation back in the day, that actually destroyed more than helped (could explain the clean un-detailed "shine" of the cross-guard and lower part of the pommel, where you would otherwise expect some kind of decoration). I'm not certain what Petersen Type, it should be attributed to? It looks like an early type Viking sword, or perhaps even transitory between Iron age and Viking Age (~750 AD?). Is it a Type B, "særtype" 1 or it could be a Type D with lost ornamentation (or an early type where it wasn't added). Officially its dated from late 8th century to early 9th century. The guard and pommel is made of solid silver and it has traces of gold (as the Egå sword). Blade had largely corroded away, but what is left shows very clearly the pattern-welded fish-bone structure. Yes, it is generally included under special type 1, and thought to be a Carolingian product. There is a matching hilt from Rostock-Dierkow with similar plain silver surfaces, so probably any additional decoration could have been no more than a layer of gilding. A similar stray hilt from Sweden does have a line of recessed decorations however. That has always been the assumption (and it was only ever an assumption, not something that we could prove). However, the discovery in the Staffordshire Hoard of three pommels which each have TWO rings, mounted either side of the cap, means that we have to reassess the meaning of these rings. I agree that it's quite hard to fit the Oppmanna Sjö sword into a chronology based on other swords, when it's so unique. It has to be examined and with regard to the ornamentation of other items, before you can make a dating-attempt. So the early D-swords being uniform in style could reflect a distribution from a specific origin point?! Your example from Rostock-Dierkow certainly shares features. By the way I found the info about the Electrolytic treatment in Anne Pedersen's book on page 76: "Electrolytic treatment of some swords in the early twentieth century has resulted in the loss of any original surface treatment or possible inlay". So depending on how the Rostock-Dierkow sword was treated and worth to have that in mind. The Kalundborg/Horsens sword was treated like that and could have lost material in the process. So it's interesting that the stray hilt from Sweden actually does retain a decoration. Whether the Scandinavian examples are Carolingian (gifts) or Carolingian imitations made in Scandinavia is the tricky question. The Rostock-Dierkow looks originally plain, whereas the surface on the Kalundborg/Horsens sword really doesn't when you inspect the big picture. So a Carolingian model, could have been elaborated with more "flash" in Scandinavia. What I find interesting is that these multi-ring features - both the sword with 5 rings on the hilt and the one you talk about from the Staffordshire Hoard - happens in England. The Kyndby sword has one ring as do the Swedish Iron Age examples; so in the Iron Age it seems to be a fairly secure statement that they are oath-rings for pagan Scandinavia. Even further the Bildsø sword and Egå sword from Denmark has 1 ring places now in the hilt. I can't think if a Danish example with two rings on the hilt? Perhaps there is some Norwegian or Swedish examples from the Viking Age. It is possible that also in Scandinavia you have a shift in meaning - possibly with Christianity. So one could speculate that the Staffordshire is a special English development, where the rings no longer signifies an pagan oath-ring between lord and retainer, but with Christianity is gets interpreted differently OR becomes primarily aesthetic. Until the Staffordshire Hoard was discovered, we had no double ring pommels either and nobody had even considered the fact that they might ever had existed (because the assumption was that they were oath rings), so I don't think that it's safe to assume that they're a purely English development. An equivalent hoard or example may yet be discovered elsewhere. I disagree with you with regard to the rings around the hilt itself, I don't think that there's a relationship between them and the rings found on pommels. We can trace an evolution of pommel rings through four (possibly five) phases, from free moving ring to the ultimate abstract form. The rings around hilts (to me) are purely decorative and are a feature of earlier swords too (Illerup, Illemose, Thorsberg etc) where they occur both singly and in multiples. However, any notions as to the meaning of rings, regardless of quantity and placement, are purely theoretic. Obviously they mean something, and they're not restricted to swords (they also appear on shields and drinking horns), but what they mean is speculation. It's just that mythological and historical accounts highlight the focus of the ring in both latest Iron Age and Viking times (and even back to the Bronze Age the ring is heavily emphasized); so it would be very weird if these rings are not oath rings. That is what a ring is - an unbroken piece of metal symbolizing an unbroken (and ideally unbreakable oath). Interestingly enough Celtic rings are open, whereas Germanic rings are closed! I would agree with you that the rings on the hilt (instead of pommel) could be purely aesthetic, but the Iron Age pommel-rings I still feel should be regarded as oath-rings. Perhaps two rings is a special instance of taking two oaths? You have examples of dual Kings (perhaps even twins) - just see the legend of Hengest and Horsa - so a dual ring could be an oath to both these joint rulers. Joint rulers are known from the early Danish viking age as well, if we trust later historical accounts? A Danish article on two K-type swords from Nationalmuseet is available on academia.edu. To vikingesværd med karolingisk planteornamentik i Nationalmuseets samlinger. It has an English summery (page 144-46). From the old Danish viking age territory only 3 K-type swords have been found. Two of those are from Hedeby and then one from southern Sjælland - possibly an old unprofessional dig from the mid 19th century from the mound "Møllebanken" at Stårby in Øster Egesborg Parish.. The article gives good pictures (incl. x-ray) of the Møllebanken/Stårby/Øster Egesborg sword and later in the article also pictures or engravings of other k-type swords. Nationalmuseet also have two Irish swords from Kilmainham, which were acquired by Worsaae in Dublin 1846-1847. The Møllebanken sword and one of the Kilmainham swords now in Denmark is part of an exclusive little group of 14 k-type swords with plant ornamentation! 1 unknown find place (in the Wallace collection, London). That is some interesting distribution! 4 of this group of swords have inscriptions with latin letters on the upper part of the cross guard. Two of them are Irish, 1 is Norwegian and 1 from Germany. A sword from Kilmainham (now in Dublin) has "hartolfa" on the guard. A sword from Ballinderry crannog has "hiltipreht" as has the sword from Liepe. Also the Ballinderry crannog sword has an +ulfberht+ inscription on the blade. The author states that one of the swords should have the inscription "hlither" and that must be the Norwegian sword from Gravråk, but to my eyes it actually looks more like "Hiltipreht" (?). The Norwegian sword from Gjersvik doesn't have a name on the guard, but is also an inscribed +ulfberht+ like the Ballinderry crannog sword. So none of them are +ulfberh+t examples. Hiltipreht must be equivalent to Hildebrecht in modern German. Hiltipreht likely a variant of Hildiberht meaning "Battle-Shining". Hartolfa is interesting of we have a name retaining an older iron age Germanic masculine -a ending; perhaps Hart-olf-a? Could this be a contraction of "Hard/strong-Wolf" as a masculine personal name? Hlither could have the first part the element ON hlíð or OHG (h)lita meaning "slope, hillside" in some kind of contractive name-combination. I would say that this is much more like personal names. The amount of Hiltipreht - 2(3?) out of 4 - indicates it is far more likely that the name inscribed is the name of the giver, rather than the receiver. The plant ornamentation is apparently predominately vine ornamentation on the swords (the Hedeby sword an exception) and must be Carolingian (& Christian) art decoration. Combining sword type and vine-ornamentation early part of 800 AD seems to be holding as a dating. So these swords is in my opinion gifts from someone to possible allies OR to warriors that have served in a comitatus under the named individual in question? Another possibility is that Hiltipreht was a very common name (much less likely). Thanks for sharing this article! Information on this group of swords is available from other scattered sources, but it's great to have it all collected in one place, and it's the first time I have seen the swords in the Nationalmuseet published (Møllebanken and Kilmainham). I can add an 11th sword to the group with plant-ornamented hilts: from Zadvarje-Poletnica in Croatia. It is very similar to the other examples, and also has a name inscribed on the cross. The name cannot be clearly read, but it is definitely different from the others - it appears to end "...ertus", so apparently a Latin name and not Germanic like the others. A number of high quality type-K swords have been excavated from elite burials in Croatia, forming a very high proportion of the Viking age swords found in this country (50% or more). These swords are generally interpreted as having been gifts from the Franks to the Croatian leaders, who (if I recall correctly) were not hostile and were falling into the Carolingian cultural influence. More information can be found in several articles by Goran Bilogrivic. Other sources (including Ian Peirce in Swords of the Viking Age) confirm that HLITER/HLITHER is an old but often repeated misreading, and the Gravråk sword does have a Hiltipreht inscription. The sword in the Wallace collection has sometimes been described as having the HLITER inscription, but the museum's current description only goes as far as reading the first three letters: "HLI..." - the rest is no longer legible (if it ever was). So it seems that in truth there are no clear examples of this inscription. Hiltipreht must be equivalent to Hildebrecht in modern German. I know of a 13th century tomb inscription for a duke Bertold where his name appears as Perhtoldus, so it does seem like there was a shift in the use of the letter P/B at some point. Thanks for this extra info Mark. The Croatian swords really does corroborate the idea, that these vine-ornamented k-type swords are part of a Frankish gift exchange. Again we can't tell if they are gifts to allies and rewards for comitatus service. So a Frankish "giver" was apparently using latin names when giving swords to a person buried in Croatia, while the swords distributed west and north so far show Germanic names. Could it be the result of the 843 split of the Frankish Empire? Or just private individual choices from the Frankish noble in question! Some apparently choose to have names on the swords, while other ornamented blades doesn't seem to have it. So with the Gravråk swords certainly not a "Hlither", then we have 3 Hildipreht swords! This guy must have been important. So all the basis for the Hlither is the initial HLI- on the sword from the Wallace collection, and that is not nearly enough. It does make it very likely to be a Frankish name and not a latin one. The other Hartolfa sword does ring alarms the way you describe it! About the danish swords the Pentz article does point out the very interesting hypothesis about a possible recipient. In early 800 AD you didn't have a lot Danes on friendly terms with the Franks or with Christianity. We know that Harald Klak lost the fight for remaining as one of the Kings and was chased out of Denmark and apparently fled and sought support from the Franks. [Denmark had very often dual Kingship during the 800's and it was an election monarchy - you were only King so long you had support from one of the 5 land-tings]. His nickname Klak is likely means "big sound" probably in the negative meaning of "empty barrels makes the most noise", to translate from a Danish proverb. Lots of noise, but little substance as he had to run like a pet to the Franks for help. Without martial prowess and success the Tings would likely just choose another King and retire the former. He was baptized at Mainz in 826 and according to Ermoldus Nigellus he received baptismal gifts from Louis the Pious, that included a sword! He tried to reassert himself, but his attempts for being elected a Danish King was thwarted in 827 and finally in 831. Harald Klak possibly died in 840's early 850's. So the splendid Hedeby sword could be Harald Klak's grave-sword, he received as a baptismal present! It could also belong to his brother Hemming, who got baptized with him in 826. Harald Klak is very well documented in the Frankish literature. So it seems that in truth there are no clear examples of this inscription. After checking my notes again, there is one more possible example.... do you remember a monograph about excavations at Kaupang? I think you sent it to me... or vice versa. It mentions a type-K sword with a "HLITER-blade(?)" Doesn't sound very definite, and I haven't found any photo or other reference to this one. That's interesting! I haven't gotten that far in reading/translating the article... is there any other evidence that would point to Harold Klak being buried in Hedeby? Was this a center of his power where he maintained more power/popularity than elsewhere? The most similar sword to the famous one from Hedeby comes from Wiskiauten in Prussia (so maybe this can be counted as a 12th member of the group). It's in poorer condition, but shares the feature of the decoration being separated into little square panels, instead of a continuous band of vines/scrollwork. Finally found it. It is on page 125 (top) of the Kaupang book 1. "Double-edged sword (JP type K, HLITER-blade?)" is all that is stated. So haven't been able to find any picture of this sword. NB: Only 4 of the 6 promised books on Kaupang have been published so far, so I'm hopeful we will soon get a book on the weaponry! The Wiskiauten really does look like the Hedeby sword in style. You mean 16th right? - the 14 K-swords in the Pentz paper, the Croatian one and the Wiskiauten example. Yet does it have any vine ornamentation anywhere? [It's not a k-type sword either]. The Hedeby sword does have it on the pommel, so it qualifies into the group, but is still different for not having vine ornamentation on the guard. About Harald Klak we are in the usual position that we don't know where he is buried. From this early we have very few runestones from Denmark and all the Hedeby runestones are much later in time. If he or his family wanted to him buried at "home" - the emporiums Ribe and Hedeby seemed to have Christian population (as you would expect for a trading site). So the highest chance of him getting a burial at all on Danish soil would have been these places. As the Hedeby sword is pretty spectacular -> it is about finding a Danish person turned Christian being worthy of such a high status gift. In the early 800's there are not that many we know of, so it is the best guess. "Haraldr the Norseman had in earlier years fled the anger of his lord Horekr [Horik I], king of the Danes, and went to King Louis, by whom he was well received. He was baptized and received into the Christian faith, and held in honour among the Franks for many years. At length he became suspect to the leading men of the northern regions and the warders of the Danish march as of doubtful loyalty and a possible treachery, and was therefore killed by them." So the Dane-Mark is here probably specifically the wilderness border territory between the Frankish fort at Itzehoe and Dannevirke-Hedeby. So if the Frankish (!) warders killed Harald Klak there (before 852 AD), it is very likely he got buried in Hedeby and not in Frankish territory (or perhaps not at all buried and the sword is his brother Hemming who died in 837). "It seems that, in the years between 829 and 852, Harald had remained a figure of some influence in the region, but he never again managed to launch a serious attempt to regain the Danish throne, nor did the Frankish monarchs seem interested in sending more armies to fight his cause. He died two years before his rival King Horik the elder." So he had apparently a presence in area, but not enough to challenge King Horik I. 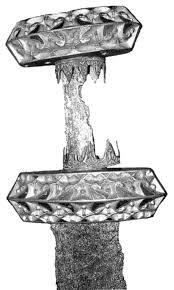 There is a single edged sword that was found as a stray find at Suure-Jaani, Viljandimaa in Estonia that has a hilt showing marked similarities to the Riga pommel and the hilts of the Telemark swords. The sword is described in "The Migration Period, Pre-Viking Age and Viking Age in Estonia." The sword is dated to right around 1000 AD, and I have always assumed that the Riga pommel and Telemark swords with similar hilts were about the same age and perhaps showing an influence from or were actually made east of the Baltic. A few swords with similar pommels discovered in Lithuania and adjacent areas of the eastern Baltic are described by Kazakavecius also. There is also mention made in one of the Icelandic sagas of a Scandinavian warrior carrying a Curonian sword into battle in England in the 11th century. Overall, it seems very likely that these atypical type Z hilts were manufactured in western Lithuania or somewhere in the east Baltic region between the late 10th century and 11th century. Overall, it seems very likely that these atypical type Z hilts were manufactured in western Lithuania or somewhere in the east Baltic region between the late 10th century and 11th century. Even the typical type Z hilts occur most frequently in the east as far as I know, and I agree that some of the atypical features seem to appear or originate in Lithuania and the other Baltic countries. Definitely by the 11th century some Curonian swords in particular were quite distinct, and the exchange of influences was no doubt taking place even earlier. The sword is described in "The Migration Period, Pre-Viking Age and Viking Age in Estonia." Do you have a print copy of this book? The photograph in the online pdf is quite low resolution, so it's hard for me to see how similar it is to the other swords, unfortunately. I have always assumed that the Riga pommel and Telemark swords with similar hilts were about the same age and perhaps showing an influence from or were actually made east of the Baltic. The Riga pommel is a bit of a puzzle I think, as it seems to me that the closest analogies are the sword from Lough Derg in Ireland, and one found in Ukraine. The hilt ferrules on the Lough Derg sword are decorated with distinctly Irish-style interlace patterns, so the hilt was presumably made in Ireland. Quite a few stray hilt ferrules of the same shape have been found by metal detectorists in England, most bearing very similar Scandinavian-style interlace patterns. The pattern is matched by the ferrules on the sword in the museum in Arhus, and the Riga sword may be similar as well. I don't know of any other examples of these types of ferrules from the Baltic, but that might only be because the documentation is less available... please let me know if you do know of any! The shape of the lower guard (thin cross-section, curved) and the opposing curve of the upper guard led Vera Evison to relate the Arhus sword, and the two from Telemark, to swords of Anglo-Saxon or Anglo-Scandinavian origin. This shape is characteristic of Anglo-Saxon type-L swords, and persists in many swords of later date found in England. The mix of English and Scandinavian forms and decorations, and the estimated dating, suggests we could be looking at products from the time of King Canute's rule over Denmark and England. Another "unusual" sword has been interpreted in the same way: the richly decorated sword from Dyback in Skane. The shape of the hilt is most similar to "typical" type-S or Z swords, but the decorative metalwork is considered to be Anglo-Saxon in style. The metalwork that originally formed the mouth of the scabbard is of noticeably different Scandinavian type. Another sword from the Baltic region does have a pommel that is quite similar to one of the examples from Telemark, with Ringerike-style decorative designs. In this case, the guard is a more typical Scandinavian shape, again similar to those of type-S swords, and decorated with knotwork that is also known from swords of that type. This sword is in Tallinn, in Estonia. A few swords with similar pommels discovered in Lithuania and adjacent areas of the eastern Baltic are described by Kazakavecius also. Are these covered in his book, or in other papers? I'm definitely curious to compare more examples. There is also mention made in one of the Icelandic sagas of a Scandinavian warrior carrying a Curonian sword into battle in England in the 11th century. Do you remember which saga it is? I know that Egil's Saga describes visits to both Curonia and England, but it's been a while since I read it, and don't recall any sword specifically. I just have a bound print-out of the PDF. It is funny, right after posting I was looking at "Swords of the Viking Age" by Peirce and thinking exactly what you said about the resemblance to the Lough Derg sword. I have a vague recollection of a ferrule find from the Baltic, but can not remember the exact find place or what it looked like at the moment. As to Kazakevecius, I will have to review what I have, I think that all of the swords are covered in the book and that the other papers mostly refer to battle knives without hilts rather than swords. As to the Icelandic sagas, the reference to the Curonian sword is found in the same saga that mentions the Scandinavian warrior hoisting his enemy in the air on the blade of his aetgir, I will have to review my Icelandic saga literature to find the exact passage.